Enjoy the taste of fresh pastries, but leave the work to us! All of these pastry creations come to you already proofed. All you need to do is pull them from the freezer and bake them. Perfect for in-store bakery and food service. It doesn't get any better than the Dutchland Classic turnover. Our delightful, all-butter puff pastry dough folded over delightful, natural fruit filling, and sprinkled with crunchy sugar crystals on top. 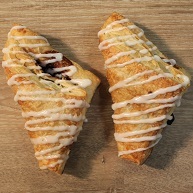 Flaky puff pastry dough and rapturous blueberry filling complement each other in this delightful full-sized turnover. 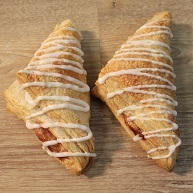 We add a sprinkling of sugar crystals to take this turnover over the top! 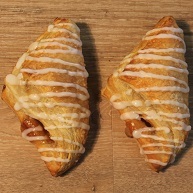 Take all of the goodness of our full-sized apple turnovers and condense it down into a mini version, the perfect serving size for many of your customers. 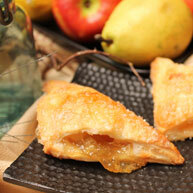 These delightful turnovers are simple to prepare: simply remove them from the freezer and bake. In about 20 minutes you'll be in business. 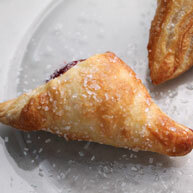 Flaky puff pastry dough and rapturous blueberry filling complement each other in this delightful mini-sized turnover. We add a sprinkling of sugar crystals to take this turnover over the top! Crisp. Crunchy. Sweet. 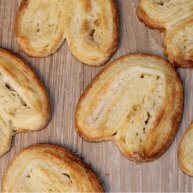 Our Dutchland Classic Palmiers can't be beat! Your customers will be thrilled with the delightful look and taste of this signature "pastry cookie." Available in 0.75 ounce minis and 4.0 ounce classics. 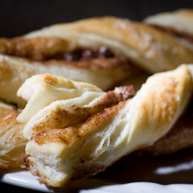 Cinnamon, sugar, and all-butter artisan Puff Pastry all with a twist. A light and flaky pastry that's freezer-to-oven easy to prepare. 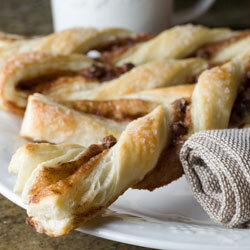 Flaky puff pastry dough and rapturous raspberry filling, all swirling around each other. 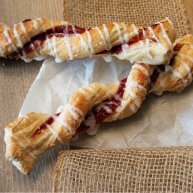 Dutchland Classic Raspberry Twists give the sweet taste of summer fruit to your customers. 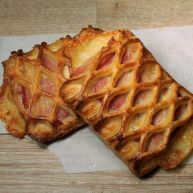 Combining natural, flavor-rich Berkshire cured ham (preferred by top chefs) and Emmentaler Swiss Cheese wrapped in a flaky, buttery croissant dough makes a savory pastry that's great for lunch or brunch. Pastries are pre-proofed and egg-washed for baking preparation convenience. 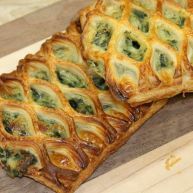 Flaky butter croissants filled with creamy rich Emmentaler Swiss Cheese and fresh Spinach. Great for lunch or brunch. Pastries are pre-proofed and egg-washed for baking preparation convenience. 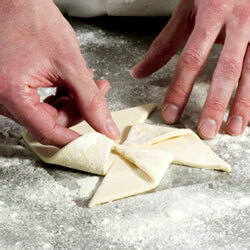 On the outside is flaky, buttery croissant dough, laminated in the old, artisan style. Inside is a wonderful, warm pastry cream with smatterings of chocolate chips. These pastries are pre-proofed for your convenience. Now, this is something to flip about! 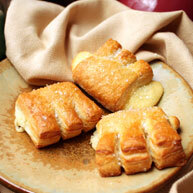 The Ready-to-Bake Mini Bear Claw is a convenient alternative to our full-sized Bear Claw. Made out of the same buttery croissant dough and warm frangipane filling, the mini claw comes pre-proofed and egg-washed, meaning all you need to do is take them from the freezer to the oven for a fresh-baked treat. Buttery, Tender, and Flaky Croissant dough shaped into the traditional doughnut shape, makes for a unique and great tasting pastry. These pastries are pre-proofed for your convenience. Problem: you don't have enough time to mix and laminate your own dough, but you want to make your own signature creations. Solution: Dutchland Classic bulk doughs, sheets, and squares.